LAS VEGAS, September 19, 2018 – Beginning Saturday, September 22, kids can join Sid the Science Kid on an amazing scientific adventure when “Sid the Science Kid: The Super-Duper Exhibit!” opens at DISCOVERY Children’s Museum. This exciting new traveling exhibit brings the award-winning PBS KIDS TV series “Sid the Science Kid” to life. For the first time ever, kids will be able to step into Sid’s world and become “science kids” themselves as they discover and investigate everyday science questions around Sid’s home, at school in the Super Fab Lab and on the playground. Through fun, hands-on activities, kids will use scientific tools and thinking to learn about simple machines, the laws of motion, magnetism, air power, and the five senses. It’s sure to be a super-duper-ooper-schmooper good time! “Sid the Science Kid: The Super-Duper Exhibit!” will be at DISCOVERY Children’s Museum Sept. 22, 2018 – Jan. 21, 2019 and is free with museum admission. Created by The Magic House, St. Louis Children’s Museum® in collaboration with The Jim Henson Company, the exhibit is generously made possible by The Boeing Company, the Employees Community Fund of Boeing St. Louis, Sally and Bill Canfield, the Crawford Taylor Foundation, Judy and Jerry Kent, Monsanto Company and Sigma-Aldrich. Local sponsorship is provided by pediped®. 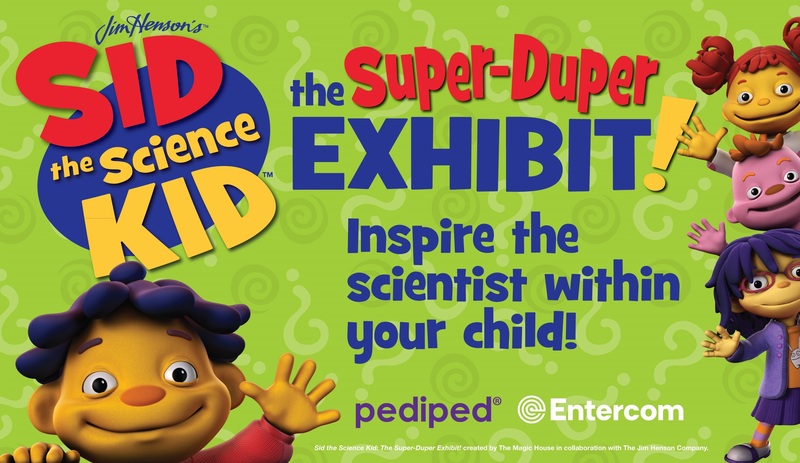 “pediped is so excited to be a Presenting Sponsor of “Sid the Science Kid: Super-Duper Exhibit!” At Discovery Children’s Museum. Supporting important local organizations committed to educating and inspiring children to reach their full potential is a core value at pediped. We especially love promoting scientific exploration in a fun, hands-on learning environment for children and their families.” Angela Edgeworth, Founder and CEO of pediped Footwear. Considered Nevada’s most popular museum, DISCOVERY Children's Museum at the Donald W. Reynolds Discovery Center has seen more than one million visitors since opening its doors in March 2013 as a private, nonprofit educational institution. Las Vegas’ only children’s museum addresses its core educational areas of science and nature, art and culture and early childhood development with 26,000 square feet of interactive, hands-on exhibits. The 3-story museum is complete with nine interactive exhibition galleries featuring traveling exhibitions, daily programs, demonstrations and activities and collaborative cultural programming for all occasions. For more information about DISCOVERY Children’s Museum, visit https://www.discoverykidslv.org, or follow on Facebook, Twitter, and Instagram. The Jim Henson Company has remained an established leader in family entertainment for over 50 years and is recognized worldwide as an innovator in puppetry, animatronics and digital animation. Best known as creators of the world famous Muppets, Henson has received over 50 Emmy Awards and nine Grammy Awards. Recent credits include the Emmy® nominated Sid the Science Kid, Dinosaur Train, Wilson & Ditch: Digging American, Pajanimals and Doozers. Features include The Dark Crystal, Labyrinth, MirrorMask, and Unstable Fables and television productions include Fraggle Rock and the sci-fi cult series Farscape. Independently owned and operated by the five adult children of founder Jim Henson, the Company is also home to Jim Henson’s Creature ShopTM, a preeminent character-building and visual effects group with international film, television and advertising clients, as well as Henson Recording Studios, one of the music industry’s top recording facilities known for its world-class blend of state-of-the-art and vintage equipment. pediped® is sold in over 750 stores in the United States and 40 countries worldwide with an offering of more than 130 designs for boys and girls between its three lines, Originals®, Grip ‘n’ Go™ and Flex®. The award-winning footwear is available in EU sizes 17 to 38 (US newborn to 6 Youth). For more information, visit www.pediped.com or call 1-702-567-0311. LIKE on Facebook at /pedipedfootwear and follow on Twitter and Instagram @pedipedfootwear.